It is quite clear that if, indeed, the tanker driver involved in the discharge of the Liquefied Petroleum Gas (LPG) explosion that resulted in the deaths of several people and the injury of tens of others, died of causes related to that catastrophic accident, then, of course, the widespread allegation, or narrative, that the deceased tanker driver had been neglectful of his duty by having his mate, or apprentice, discharge the gas cannot be factual (See “Tanker Drivers Dispute NPA Findings on Cause of Atomic Gas Explosion” Atinkaonline.com / Ghanaweb.com 10/16/17). 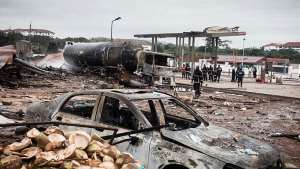 The reference here, of course, is to the October 7 gas explosion at the Atomic Junction, near Madina and the main campus of the University of Ghana, Legon. What clearly needs to be done, even as suggested by Mr. Shafui Mohammed, President of the Ghana Gas Tanker Drivers’ Association, is for the Energy Ministry and the Environmental Protection Agency (EPA) to critically examine the causes of previous accidents in order to be able to put in place the most effective measures to forestall any future occurrences of the same. The preceding dispute, presently, is further complicated by the recently reported flat refusal of the agency that investigated the Atomic Junction tragedy to publicly release its findings. I don’t have the details of the Gas Redistribution Policy announced by the Energy Ministry, but it clearly appears to me that what is direly needed, and promptly so, is a critical examination or reexamination of how gas stations in the country are constructed and sited or located. I also don’t know how the so-called Right to Information (RTI) Bill’s agitation by some Ghanaian social commentators and critics stands to benefit the individual Ghanaian citizen, but I am quite certain that such bill, were it to be approved by Parliament and signed into law by President Addo DankwaAkufo-Addo, would likely benefit media operatives and enhance the quality of information fed into the mainstream of our society. Even so, the mere passage of a Right To Information law may not necessarily democratize access to the most critical or relevant information, especially where such access is deemed to conflict with our national security needs and requirements. What we need to be agitating and fighting for is the imperative necessity for taxpayer-supported agencies to perform efficiently to the remarkable enhancement of the general quality of life in the country. Monopolizing information as if it was the private property of public officials, rather than the Ghanaian citizenry at large, regresses the general development of the country.